World-premiering next month at the 2014 Toronto International Film Festival in advance of its November release in the U.S and Canada, THE THEORY OF EVERYTHING stars Eddie Redmayne ("Les Misérables") and Felicity Jones ("The Amazing Spider-Man 2") in the extraordinary story of one of the world's greatest living minds, the renowned astrophysicist Stephen Hawking, who falls deeply in love with fellow Cambridge student Jane Wilde. Once a healthy, active young man, Hawking received an earth-shattering diagnosis at 21 years of age. With Jane fighting tirelessly by his side, Stephen embarks on his most ambitious scientific work, studying the very thing he now has precious little of - time. Together, they defy impossible odds, breaking new ground in medicine and science, and achieving more than they could ever have dreamed. 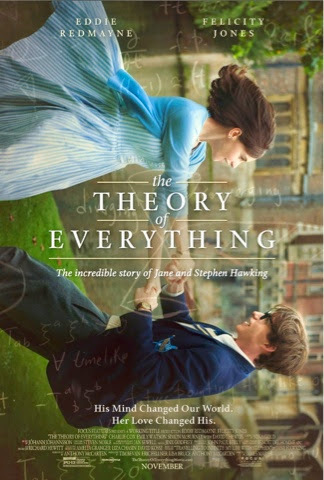 The screenplay by Anthony McCarten is based on the memoir Travelling to Infinity: My Life with Stephen, by Jane Hawking, and is directed by Academy Award winner James Marsh ("Man on Wire"). The film's cast also includes Charlie Cox ("Daredevil"), Academy Award nominee Emily Watson, Simon McBurney ("Magic in the Moonlight"), and David Thewlis ("Harry Potter").